According to a new market report published by Transparency Market Research titled “Wet and Cold Appliance Market, Type – Dishwasher [Built-in Standard Dishwasher (Drying with Ventilation, Drying Without Ventilation), Countertop Dishwasher (Drying with Ventilation, Drying Without Ventilation), Drawer Dishwasher (Drying with Ventilation, Drying Without Ventilation)]; Cloth Dryer (Vented, Condenser); Washing Machine (Front Loading, Top Loading); Domestic Refrigerator [Top Freezer (Static Cooling, Dynamic Cooling), Bottom Freezer (Static Cooling, Dynamic Cooling), Side-by-side (Static Cooling, Dynamic Cooling), Built-in (Static Cooling, Dynamic Cooling), Compact (Static Cooling, Dynamic Cooling)– Global Industry Analysis, Size, Share, Growth, Trends, and Forecast, 2018 – 2026,” the global wet and cold appliance market is expected to reach US$ 200.8 Bn by 2026, expanding at a CAGR of 6.2% from 2018 to 2026. Asia Pacific held the highest share in the wet and cold appliance market in 2017. The growth of demand is expected to accelerate with rising disposable incomes. Washing machines and refrigerators are garnering an increasing share of the market due to reduction in prices and higher disposable incomes. Increasing disposable income and the need for energy efficient products is expected to lead to significant sales across regions. Rising incomes in urban areas characterized by increasing disposable income and purchasing power have resulted in high product demand. Increasing globalization and automation has made manufacturing economical, enabling companies to reduce the cost of appliances such as refrigerators, washing machines, and dishwasher for consumers. Furthermore, progressively changing lifestyle in rural areas together with the rising disposable income of consumers would build a lucrative roadmap for domestic refrigerators over the forecast period (2018-2026). Asia Pacific held the major share in the wet and cold appliance market in 2017. Adoption and usage of wet and cold appliances such as domestic refrigerators and washing machines is high in the region; also, demand is projected to be high for smart wet and cold appliances such as smart refrigerators and smart washing machines in this region during the forecast period. Wet and cold appliances in Europe have reached the targeted growth phase due to a strong product pipeline and well-established portfolio management approach. 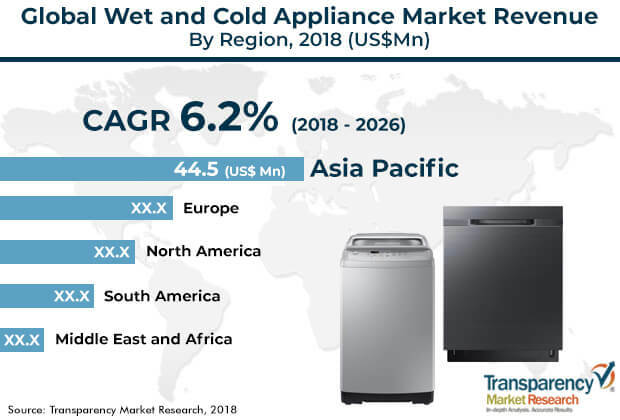 Rising disposable income and introduction of efficient wet and cold appliances are likely to drive the wet and cold appliance market at a good pace. Key trends supporting the growth of the market includes increase in the usage of Internet of Things (IoT), and growth of wireless communication technology. In the global wet and cold appliance market, Asia Pacific held the largest market share in 2017. Adoption and usage of wet and cold appliances such as domestic refrigerators and washing machines is high in this region. Further, demand is high for smart wet and cold appliances such as smart refrigerators and smart washing machines in Asia Pacific. As an early technology adopter, the North America wet and cold appliance market is witnessing significant growth due to increased demand for smart wet and cold appliances. By type, the domestic refrigerator segmentis expected to have the highest CAGR of 6.7% from 2018 to 2026. The growth of this segment is attributed to major adoption and increased usage of refrigerators in households in Europe and Asia Pacific. Also, rise in consumer spending power and ease of financing schemes tends to increase the growth of the domestic refrigerator market. Asia Pacific accounted for 35.7% of the global wet and cold appliance market in 2017 and is anticipated to continue its dominance over the forecast timeline due to rapid urbanization and industrialization in this region. Europe is witnessing significant growth with a market share of 26.4% in 2017. The wet and cold appliance industry is characterized by a number of local and regional players and intense competition among them. Some of the industry participants in the global wet and cold appliance market are AB Electrolux, Videocon Industries Ltd., Haier Group Company, LG Electronics, Philips Electronics, Whirlpool Corporation, Panasonic Corporation, Robert Bosch GmbH, Sharp Corporation, Sub-Zero Wolf, Daewoo Electronics Corporation, and Samsung.